Sherzad S. Ali Department of Kurdish Language, College of Basic Education, University of Duhok, Kurdistan Region - Iraq. Ayad F. Othman Department of Kurdish Language, College of Basic Education, University of Duhok, Kurdistan Region - Iraq. The present research entitled “Refusal: Verbs and Strategies. A Pragmatic Study “this research deals with the principles and strategies of refusing within verbs of requesting, offering, invitation and suggestion. The research is divided into three levels of individuals of society. The levels are the same level, the high-low rank level and the low-high rank level. The ratio of each refusal strategy used is determined according to general descriptive analytical methodology depending on statistical data in analyzing each strategy ratio. The research consists of two chapters and introduction. The first one deals with refusal strategies while the second one deals with speech act of refusing. The research has come up with many findings with writing the abstract in Arabic and English. عه‌بدولواحید موشیر دزه‌یی، واتاسازى، چه‌ند لێكۆلینه‌وه‌یه‌كى سیمانتیكى و پراگماتیكییه‌، چاپی یه‌كه‌م، چاپخانه‌ى خانى(هه‌ولێر)، له‌ بڵاوكراوه‌كانى ده‌زگاى توێژنه‌وه‌ و بڵاوكردنه‌وه‌ى موكریانى، هه‌ولێر، 2009. ــــــــــــــــــــــــ، شێواز و پراگماتیك، چاپا ئێكێ، چاپخانه‌یا الروچه‌، ئیسته‌نبول، ژ وه‌شانێن ده‌زگه‌ها سپیرێز، دهۆك، 2012. فرانك نوفو، قاموس علوم اللغة، ترجمة: صالح الماجري، المراجعة: طيب البكوش الطبعة الاولى، المنظمة العربية للترجمة، بيروت، 2012. Alicia & Esther. 2011. RESEARCH METHODOLOGIES IN PRAGMATICS:ELICITING REFUSALS TO REQUESTS, Estudios de lingüística inglesa aplicada. Universitat Jaume I, Castellón, España. Asmali, Mehmet. (2013). Cross- Cultural Comparison of Non-Native Speakers' Refusal Strategies in English. International Journal of Language & Translation Studies, Vol-1 Issue-3, 111-135. Austin, J. L. (1962). How to do things with words. New York: Oxford University Press. Brasdefer, J. C. F. (2008). Politeness in Mexico and the United States. Amsterdam: John Benjamins Publishing Company. Deviani & Gunawan. 2011. THE REFUSAL STRATEGIES USED BY THE OLD AND YOUNG FOREMEN IN A BAKERY IN SURABAYA. English Department, Faculty of Letters, Petra Christian University. Surabaya, East Java, Indonesia. Jiang (2015) An Empirical Study on Pragmatic Transfer in Refusal Speech Act Produced by Chinese High School EFL Learners. English Language Teaching. Published by Canadian Center of Science and Education. Vol. 8, No. URL: http://dx.doi.org/10.5539/elt.v8n7p95. Khalil (2014). A study of Refusal Strategies in Kurdish language. 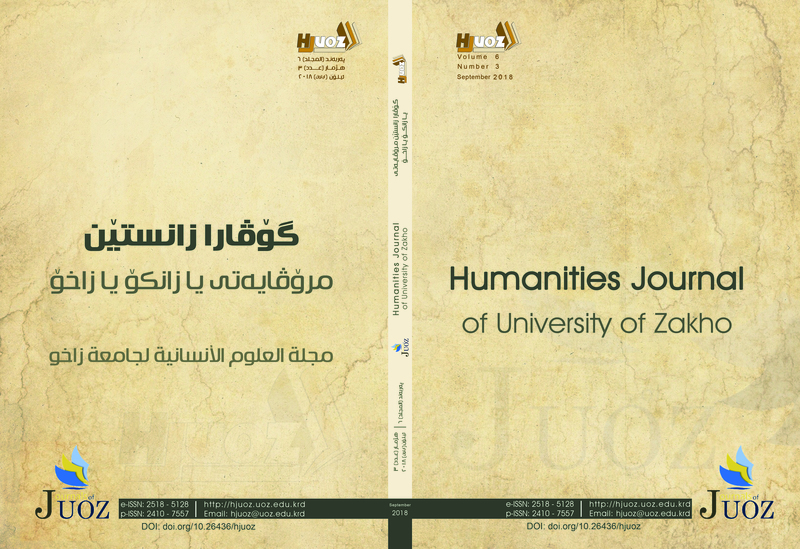 Kirkuk University Journal- Humanity Studies Vol:9 No:2.
foreign language. Graduate Theses and Dissertations. University of South Florida. Moaveni, Hiroko Tsuiki, (2014). "A Study of Refusal Strategies by American and International Students at an American University" (2014). Theses, Dissertations, and Other Capstone Projects. Searle.J.R, (1969). Speech Acts, Cambridge University Press. Searle, J., & Vandervken, D. (1985). Foundations of illocutionary logic. Cambridge: Cambridge University Press. Yang, Jia. 2008. How to Say ‘#o’ in Chinese: A Pragmatic Study of Refusal Strategies in Five TV Series. Ohio: The Ohio State University. Yule, G. (1996). Pragmatics. London: Oxford University Press. ZHAO. 2013. Politeness Strategies in Refusal. Sino-US English Teaching. Bohai University, Jinzhou, China. ISSN 1539-8072, Vol. 10, No. 12, 920-924.